Modoc County is a lovely chunk of "Montana Big Sky Country" in extreme northeastern California. It became a county in 1874, carved entirely out of the eastern third of the ten-Siskiyou County. There are sagebrush plains, montane meadows, waterfowl reserves, and large expanses of open country. The Klamath and Warner ranges bookend the county's edges, and large lakes (Goose Lake, Clear Lake) straddle its border with Oregon. Although often covered with snow in winter, the county can be exceptionally beautiful in summer. There have been many times when there were no resident birders living here, so the county is decidedly under-birded. When it has been checked, Modoc NWR, near Alturas, has proven to be a prime destination. Perhaps 90% or more of the county's vagrants have been from that refuge. 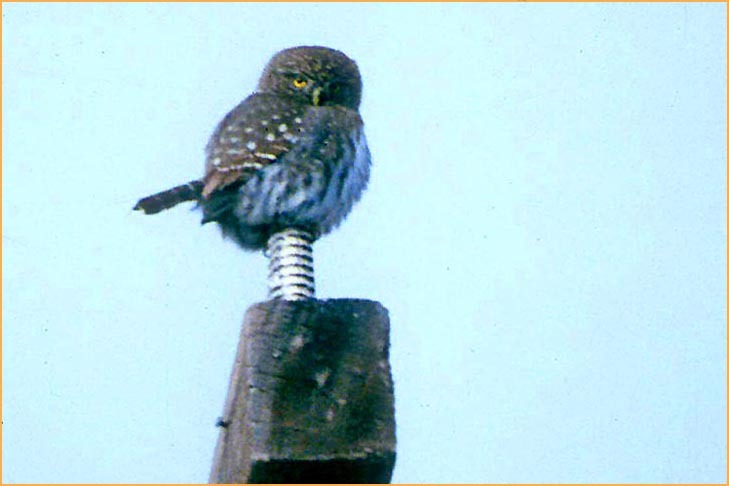 For a Modoc County photo, the choice is this pygmy-owl perched up on a electrical post in the middle of a crisp morning. It is always an unexpected treat to come upon a pygmy-owl in the daytime, and it has only happened to me a half-dozen times in 30 years. This photo is now 25 years old, taken with rather marginal camera and lens, but still portrays the pugnacious little guy reasonable well. I no longer have any recollection why I did this winter weekend trip to extreme northeastern California, and where I notes should be, there is a blank page [meaning that I intended to fill it in shortly after the trip, but never did]. The only record of that trip is this one shot. I need to return to Modoc to take more photos, as there are very few in my collection. 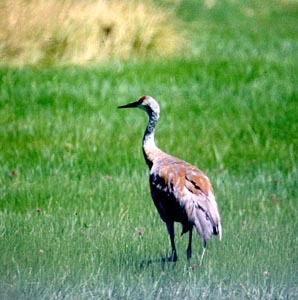 I shot this young Sandhill Crane in Surprise Valley (below left) and a distant juvenal Semipalmated Sandpiper at Dorris Reservoir on 14 Aug 2000. 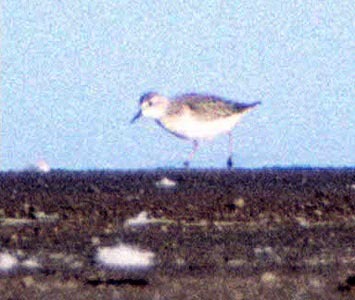 Semi Sand is a scarce bird for Modoc, and we were surprised to find it. Modoc County has quite a variety of habitats. 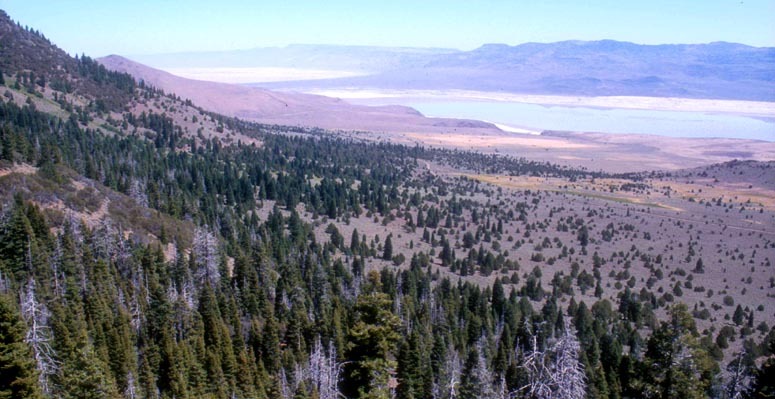 The Modoc Plateau stretches out to the horizon in the top scenic, taken from above the town of Day (Aug 2000). The middle shot is of Dorris Reservoir near Alturas, a man-made lake among sagebrush that has shorebird habitat in fall migration; Rita is looking at the Semipalmated Sandpiper on 14 Aug 2000. The bottom photo shows Surprise Valley from the south; this is the extreme northeast corner of California (Aug 2000).